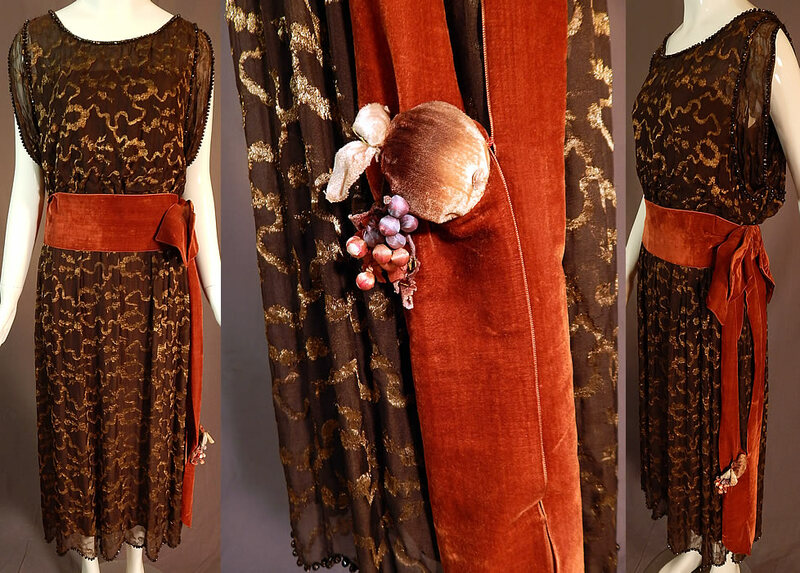 This vintage Art Deco brown silk gold lamé beaded belted flapper dress dates from the 1920s. 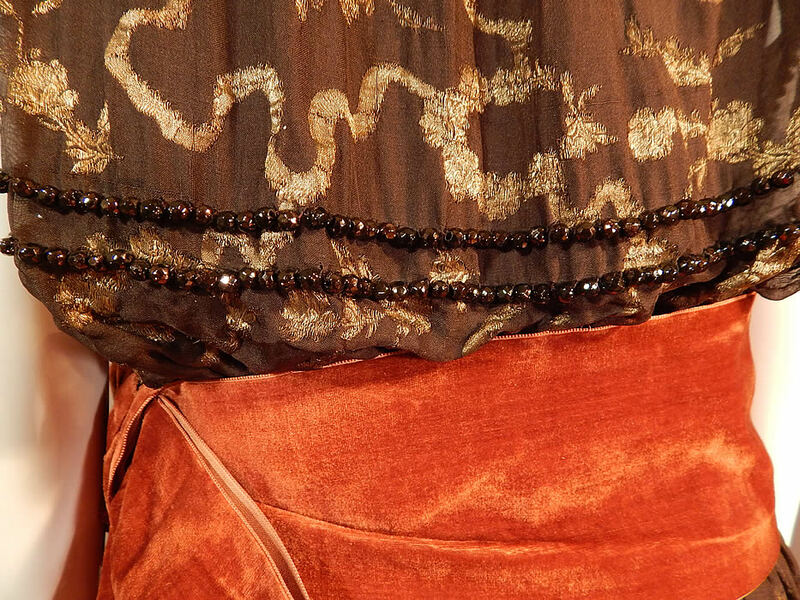 It is made of a dark brown sheer silk chiffon gold lamé fabric with gold metallic threads woven through in a wavy ribbon, floral garland wreath design and black faceted glass beads edging the top and scalloped bottom skirt hem. 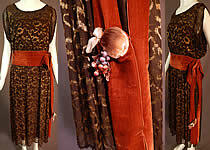 There is an burnt orange rust color velvet ribbon sash belt with side bow and colorful silk velvet grape berry leaf fruit trim three dimensional appliquéd near the bottom end. 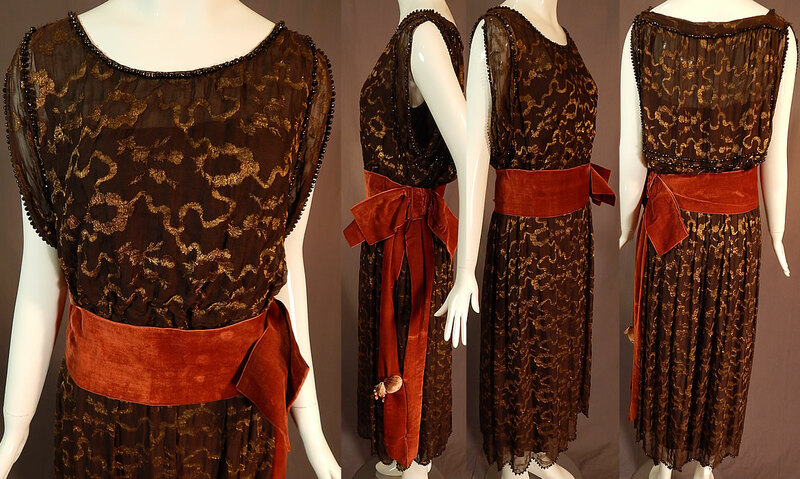 This fabulous flapper style dress a layered sleeveless top, an attached belted ribbon sash waist, a fitted waistband with inner, outer side snap closures and is fully lined in a brown silk fabric. The dress measures 48 inches long, with a 36 inch bust and 26 inch waist. It is in good condition, with only a few loose missing beads and tiny holes on the inside silk lining. This is truly a wonderful piece of Art Deco wearable textile art!